Other Products: Glass Beads, Flower Flock-yellow, Embossing powder-pink, VersaMark ink. Instructions: Click here to view a large photo of this project. Envelope size 7"x4"(take cardstock size 7"x12" and score at 4", 8" and at one edge cut one classic Border Basics Die as shown and add crystal clear glitter on the diecut.) Now adhere pattern paper on the cardstock and distress the edges. On the top panel of the envelope on the left and right side stamp coneflower with versamark ink and sprinkle embossing powder and heat set it with heating tool. Cut Circle die and adhere pattern paper and cut two circle border die and add some glitter powder and glass beads and then cover with one OHP sheet and again one more circle border with white cardstock and add crystal clear glitter. Next stamp some Backyard blossoms with archival ink plum, leaf green, and die cut them with matching die. Color them too with archival ink and then shape them with deluxe flower shaping tool kit and then sprinkle some glass mini beads. Now arrange these embellishments as shown. 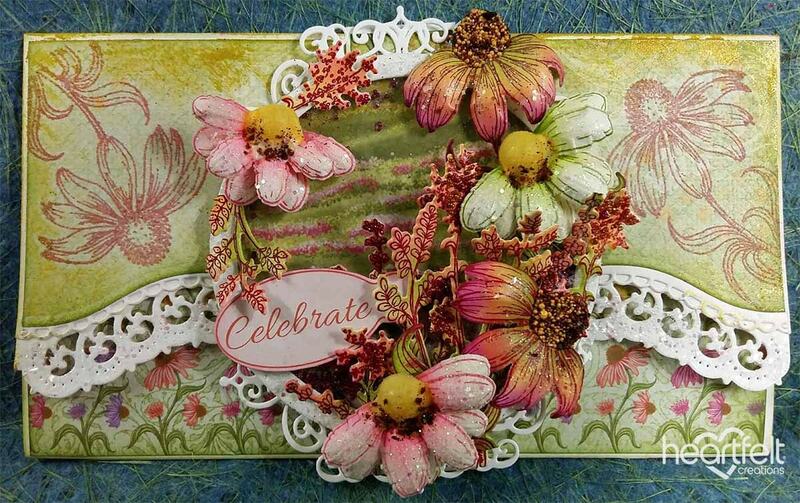 Now stamp from Garden's Edge Coneflower with plum archival ink and cut them with matching die, and color them with archival ink leaf green, sunflower and cactus flower and shape them and then at the centre of the flower sprinkle prills and Redland elements and sprinkle crystal clear glitter on the flower petals. Now adhere these flowers on the right side on the circle die as shown. Stamp Delightful daisies with archival ink-leaf green and rose madder and cut them with matching die and color them with the same ink and shape them with deluxe flower shaping tool kit and then add some flower flocks for the centre of the flower and add some Redland elements and then sprinkle crystal clear glitter on the flower petals. Arrange all the elements as shown. Now add sentiment from the paper collection.